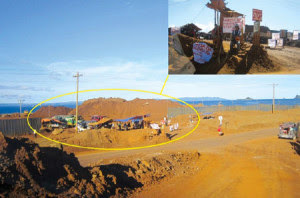 PUYAT, Carmen, Surigao del Sur – Officials had endorsed the ancestral domain claim and demand for royalty by a group of Manobos that recently staged a barricade against a mining company in Claver, Surigao del Norte, documents obtained by MindaNews showed. The Kahugpungan sa Nagkahiusang Tribu nga Manunubod sa Yutang Kabilin (Katrimyuka) barricaded the causeway of Adnama Mining Resources Inc. (AMRI), in Barangay Urbiztondo, Claver from Sept. 2 to Oct.5 to demand payment from the firm. Led by Datu Mansa Samuel D. Sumanda, Datu Rommel Dawog and Datu Cesar Bat-ao, the Manobos said that AMRI is operating in parts of what they claim as their ancestral domain. In an interview last Saturday in his residence here, Sumanda said Surigao City Mayor Ernesto T. Matugas had tried to help them in collecting their royalty as “legitimate” Lumads. Sumanda was referring to a letter from the mayor to AMRI dated March 13, 2013 and which the official admitted in an earlier interview with MindaNews. Sumanda added that Surigao del Norte Gov. Sol F. Matugas had certified that their Certificate of Ancestral Domain Title application has gone through the legal process. Further, on May 20, 2013, Roque Agton, Commissioner for Southern and Eastern Mindanao of the National Commission on Indigenous Peoples wrote to four mining companies operating in Surigao del Norte and to the Mines and Geosciences Bureau (MGB) regional office that the Manobos are entitled to royalty. “We are aware that non-payment of royalties is a legal ground for withholding the transportation and shipment of ores,” part of Agton’s letter said. The Manobos staged the barricade to prevent AMRI from transporting its ores which it has been shipping to China. Sumanda denied receiving support from politicians during their month-long barricade. He said some of their fellow Manobos who are working abroad provided for their needs. He, however, did not disclose the total amount they spent during the barricade saying it is being reviewed by their auditor. Another group of Manobos in Lanuza, Surigao del Sur has been receiving royalty shares from the Platinum Group Metals Corporation (PGMC) and Shenzhou Mining Group Corporation (SMGC) which are operating in Claver. The group is headed by Datu Anilao Dawog, who is currently a municipal councilor of Lanuza. Just last month, Dawog got a total of 6 million pesos from PGMC. PGMC and SGMC have been paying royalty to both the Manobos and Mamanwas. “We are paying a total of two percent so that no trouble will occur,” according to Jacqueline Mel Del Leon, the corporate secretary of SGMC. SGMC’s operations have been suspended following the cease-and-desist order from MGB last year and a court order last July telling the company to vacate the mining area. But Manobos from Cantilan and Carrascal in Surigao del Sur who requested anonymity said they are ashamed of what Sumanda and Anilao Dawog are doing. “It’s a modern day version of ‘pagpangajao’ (roughly a raid by one tribal group against another village),” they said. Dawog’s and Sumanda’s groups are already holders of CADT 002 in Barangay Pakwan, Lanuza, and yet are claiming areas outside of their domain, a Manobo from Cantilan said. Another Manobo said the two groups have violated Manobo customary laws and tradition. “They are a bunch of racketeers who just are pretending that they are the legitimate ancestral domain claimants but they can’t even show us where this royalty share that they got was spent,” a Manobo woman from Cantilan said. These Manobos requested anonymity for fear of reprisal saying Dawog and Sumanda have armed members. MindaNews tried to get the side of Dawog but he refused to comment. Sumanda has applied for an ancestral domain title which straddles Carrascal, Surigao del Norte and Surigao City and covers at least 80,000 hectares. “That includes the coastal areas and the island of Nonoc and portion of Dapa,” he said, adding his ancestors had settled in Barangay Anomar in Surigao City and in Gigaquit town in Surigao del Norte. But Jimmy Quijano of Surigao City called Sumanda’s claim a joke, saying he never heard that the Manobo tribe had lived in the city anytime in the past. AMRI has been mining nickel ores in Urbiztondo in Claver starting 2011 after they got the Mining Production Share Agreement from Oriental Synergy Mining Corporation in August of that year. But the recent Manobo barricade had paralyzed the operations of the said mining firm for a month.